Few dogs are as unique as the Chihuahua. This toy sized dog is well known for its erect ears and large round eyes. Often the dog of choice for those in restricted living spaces, a well-trained and well-cared for Chihuahua can be a wonderful companion and a joy to have as part of a family. Keeping your Chihuahua at the peak of physical and mental wellness involves lots of stimulation, exercise, and the right food. However, with so many types and brands available, knowing what to feed them can be tricky. Luckily, that’s where we come in. Here are five of the best dog foods chosen by our panel of pet lovers and Chihuahua experts. Taste of the Wild uses a combination of venison, duck, lamb, egg, and ocean fish to create a food that is high in easily digested proteins and fat, and also provides optimal levels of amino acids. The kibble pieces are just the right size for your small dog’s teeth and the addition of prebiotic fiber and probiotics help to support your dog’s digestive health. The grain free recipe gains its fiber, vitamins, minerals and antioxidants from the inclusion of fruits and vegetables. This improves the health of your dog’s skin and coat and is great for those whose digestion is upset by wheat and grains. 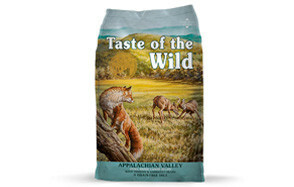 The dry food is also free from artificial colors, flavors and preservatives. 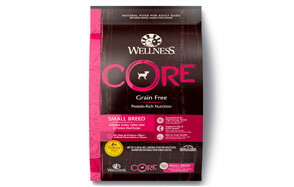 Wellness CORE is specifically designed to meet the higher energy level needs of small breeds, such as the Chihuahua. Made with premium chicken and turkey, it is naturally high in protein and supports the increasingly popular raw feeding philosophy. This means that it is completely free from grains, animal by-products and artificial colors, flavors and preservatives. The nutrient dense kibble is designed for small teeth and includes the perfect balance of essential vitamins, minerals and fatty acids that your dog needs for a healthy coat and skin. The natural fiber, prebiotics and probiotics work together to improve and maintain good digestive health, while the high-quality protein and complex carbohydrates ensure optimal energy levels. 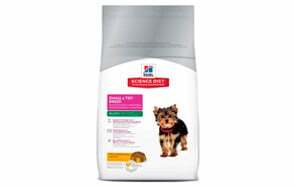 Hill’s Science Diet as been developed specifically for toy breeds and small breed puppies, taking the specific needs of these size animals into consideration. Developed with DHA from high quality fish oil for healthy brain and eye development, the dry food also contains vitamins, minerals and amino acids from high quality and easy to digest ingredients. While the kibble contains no artificial colors, flavors or preservatives, it is created from a mix of chicken meal, fruits, vegetables, grains and wheat. This means that it may not be suitable for dogs with intolerances to wheat or gluten, or for those whose owners are concerned about feeding their pooch these ingredients. Otherwise the combination of crunch and flavor is something your Chihuahua will thank you for. BLUE Life Protection formula is created from a mix of deboned chicken, whole grains, fruit and vegetables. With no poultry by-products, corn, wheat, or soy, the food provides a great taste and provides your dog with the essential amino acids they need to stay healthy. Complex carbohydrates and high-quality protein ensure that your Chihuahua’s energy needs are met, as well as providing them with all the nutrients they need. No artificial colors, flavors or preservatives are used in the development of this dry food, adding to its superior taste. The nutrient rich elements of the food are also processed at a lower temperature to the rest of the kibble to ensure that its potency is preserved. This ROYAL CANIN kibble mix is designed specifically for Chihuahua puppies from 8 weeks to 8 months old. The kibble is small and created in a shape that is easy for puppies to break and chew. The food contains balanced levels of highly digestible proteins to help with your puppy’s growth and development. The kibble is also designed to reduce stool odor and meet the needs of fussy appetites – something Chihuahuas are well-known for. The fiber content, quality protein and carbohydrate sources are balanced to create a food that offers great taste and smell and supports good digestion. The addition of Vitamins E and C, Lutein and Taurine helps to support your puppy’s natural defenses, while offering complete and balanced nutrition. Chihuahuas are very energetic dogs who need a lot of exercise and a diet rich in protein and high quality complex carbohydrates to help them maintain consistent energy levels. However, with so many foods purporting to offer just this, how do you choose between them, and ensure that you are feeding your pet pooch the right ingredients. The best way to achieve this is by looking closely at the ingredients that any food has, including the source of its protein and carbohydrates. Reading our buying guide also helps you to make the best decisions for your canine companion. How Much Food Should I Feed My Chihuahua Puppy? When deciding how much to feed your Chihuahua, you should start by finding a good quality food designed for your breed of dog. If you cannot find one that you like that is breed specific, then look for one that is designed for toy or small dogs. This is important because toy and small dogs have very specific protein needs and require small sized kibble pieces. Once you have found the right food, start by following the feeding guidelines on the packet and then adjust the quantity up or down to suit your individual dog’s needs. Feeding guidelines are usually set based on the weight of your dog, so it is important to weigh them regularly and to know the recommended weight for your dog at their age and stage of life. If your Chihuahua is severely over or underweight, then you should get advice from your local veterinarian. In terms of when to feed your Chihuahua, it is recommended that for puppies under 3 months, food is left out all the time, so they can eat as they need to. From 3 months, food should be split into 3 or 4 separate meals. This should be reduced to 2 to 3 meals at 6 months and 2 meals a day from around a year old. Chihuahuas are very energetic dogs and need high levels of protein and complex carbohydrates to maintain healthy muscles and to keep their energy level stable. If foods are full of processed carbohydrates then, like humans, they experience steep rises and falls in energy. This has a negative effect on their physical health and on their temperament. Good carbohydrate sources include fruits, vegetables and whole grains. It is recommended that vegetables make up about 40% of the ingredients in your Chihuahua’s food. Fiber is important to the transit of food through the digestive system. Too little and your dog is likely to suffer from constipation. However, the wrong type can leave them bloated as well. Again, this is where whole grains and vegetables are important. It is worth reiterating the importance of not only a high meat content, but also the need for good quality meat to be included in your dog’s food. Meat should be the number one ingredient on the list of ingredients in your food. Avoid foods where the majority of the meat comes from by-products. Ideally, you want a food that contains no animal by-products as these contain little to no nutritional value. Chocolate – especially dark chocolate contains high levels of theobromine, which is poisonous to dogs. Symptoms of poisoning include vomiting, diarrhea and seizures. Onions – along with garlic, these are known to cause anemia in dogs. Caffeine – Chihuahua’s are already energetic enough and do not need stimulants. It is also dangerous for them as it raises the heart rate. Bones – chicken bones especially as these can splinter and cause problems long the digestive system, as well as catching in teeth and gums. Bones in general can cause diarrhea and other tummy problems. Grapes, raisins, cherries – along with macadamia nuts and avocado, these are toxic to your pet. Grapes and raisins can cause kidney failure in dogs. Xylitol – Artificial sweeteners can cause liver damage and drastic drops in blood sugar levels in dogs. For a small dog, like a Chihuahua, it would take very little to create toxic dose, so it is best avoided altogether. Alcohol – while t is obvious that dogs should not be given alcoholic drinks, alcohol is present in, or created in the dog’s stomach by, many other things that you may not automatically consider dangerous. Yeast, a common ingredient in everything from pizza to bread rolls is one such item. Pet food labels can be very confusing and contain a lot of different terminology as well as very long lists of ingredients. Here are the top things to watch out for when you are choosing the perfect food for your pooch. Good quality food for Chihuahuas has a protein / carb/ starch ratio of around 40 / 40 / 20. Protein needs to come from quality meat and fish sources and carbs should be complex carbohydrates from whole grain, fruit and vegetable sources. Regular potato does not count as a complex carbohydrate and if it is included, it should be considered a starch, along with items such as pasta. Amino acids are the building blocks of protein and are therefore essential to your dog’s wellbeing. Look for foods that list the specific meat sources to ensure that your dog is getting the amino acids they need. Like all dogs Chihuahuas need food that is balanced and contains all the vitamins and minerals they need for healthy immune systems, healthy skin and coats and healthy development. Quality foods should list vitamins, A, E, C and B-12 among their ingredients, along with DHA omega oils, folic acid and minerals including calcium Iodate and Sodium Selenite. Chihuahuas only have small teeth and jaws, it is therefore important that the food you buy reflects the needs. Kibble should be small and easy for them to bite. Dry food is better than wet food for Chihuahuas generally, because it helps maintain healthy teeth and gums. An increasing number of dog foods are wheat, or wheat and grain free. There is no agreement as to whether dogs should avoid grains, unless they have a specific stomach or allergy issue. However, some owners prefer a completely grain free approach to food. If you are buying a food that includes grains go for one that uses whole grains as this is more beneficial and contains better fiber. These should be avoided at all costs, along with corn syrups, fillers and refined grains. They have no benefit to your Chihuahua and could be harmful, preventing uptake of nutrients and affect the speed of transit of food through the digestive system. The age of your Chihuahua affects the specific balance of nutrients, vitamins and minerals they need. If you have a puppy, then it is best to buy food specifically designed for this stage of their life. Pregnant or nursing dogs also have different needs and you may find a different food, feeding pattern, or amounts of food are needed during this time. If you have any concerns about the wellbeing of your dog, whether related to food or not, seek help from your local veterinarian as soon as possible. But, by following this guide, you can ensure that you buy the right food for your Chihuahua to keep them happy and healthy for many years to come.